Green tree frog (Hyla cinerea) in south Georgia; photo by tom spinker on Flickr (noncommercial use permitted with attribution / no derivative works). 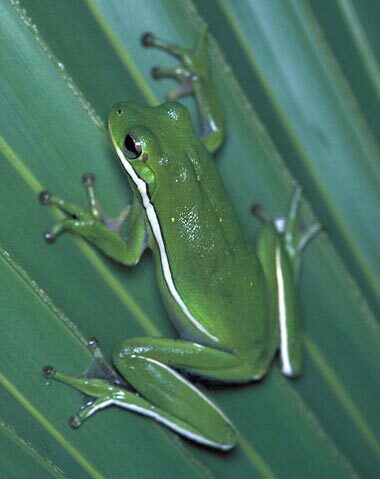 The diminutive green tree frog (about 2 inches long) is lime-green with a white stripe down each side. 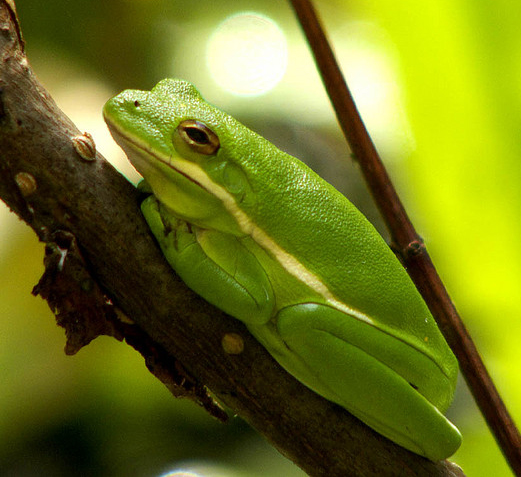 The green tree frog is also recognized by the night-time choruses produced by large groups of males during the warm months in Georgia. It spends most of its time in the trees eating insects, but is also sometimes found clinging to smooth surfaces like windows and sliding glass doors. Green tree frog photo by Jane M. Rohling / U.S. Fish & Wildlife Service.